Kenny Lee Hall is a St. Louis musician whose music I just love. He’s a fantastic songwriter and downright hilarious. Ask him to play his song “Saratoga Rose” sometime or as I like to call it, the “Yoga Pants Song.” Simply gut-bustingly funny stuff. I love it. I was thrilled when he asked me to design a new website for his music business and I’m just as thrilled with how it turned out. 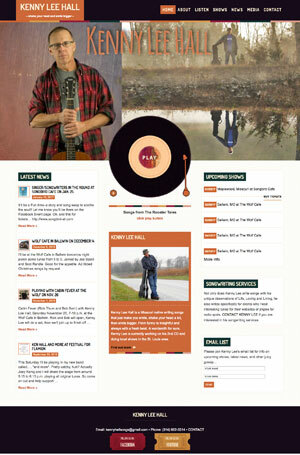 We selected a fun WordPress template that perfectly captures his unique quirky style. You can listen to some of his music, check out his upcoming shows, find out about his songwriting services, and read his news blog. Check out his music; you’re gonna’ really enjoy it!